Reformation Day is a religious observance that falls on October 31 and celebrates the Protestant Reformation. It is a state public holiday in Slovenia, Chili and some of the German states (Länder). On October 31, 1517 German friar and Catholic priest Martin Luther wrote a letter to Albrecht, Archbishop of Mainz and Magdeburg. In his letter, Luther criticized the sale of indulgences. He also posted his Ninety-Five Theses of the Power and Efficacy of Indulgences on the door of All Saints' Church in Wittenberg. This event is regarded as the initial catalyst for the Reformation. Luther sought to reform the Roman Catholic Church. 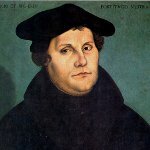 With his letter and theses, Martin Luther initiated a schism within the Western Christianity which is now referred to as the Protestant Reformation. The Reformation eventually spread throughout the Europe, leading to the emergence of various Protestant denominations. Later, immigrants brought Protestantism to other continents. Reformation Day was first observed in the 1560s, but an annual observance on October 31 began in 1717. Today, many Lutheran churches transfer the holiday, so that it falls on the Sunday closest to October 31. This Sunday is referred to as Reformation Sunday.